This magnificent desert originated in France where its earliest record is from a cookbook from the year 1691. The translation used in 1700s was actually called burn cream. In later years it was also called English cream. What is fascinating is that after this time of the 1700s, it disappeared from most French cooking books until it was revived back in only in the 1980s. 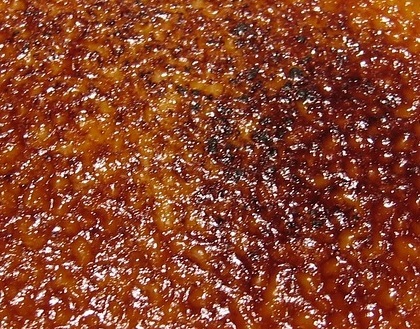 The desert is depicted as being rich and soft with a base of custard. Let’s not forget the nice caramel coating on top for its signature look. The first story of apple pie happens to be from the country of Kazakhstan where Alexander the Great first encountered it. The great Alexander then decided because it was so tasty, brought the recipe back home to Macedonia in 300 BC. So it isn’t really an American invention? Furthermore there is evidence for its existence back in the Stone Age in the areas of Switzerland. How it became popular in America started via the Romans. The Empire of Rome brought the apples to one of his colonies back in 1 A.D. to what is now England. From England, the fruit was brought overseas to the Americas. The colonists started to spread the apple seeds along many trade routes through the New World. Even before the apples were brought to the New World, people in Europe were already beginning to cook apples and other such fruits and mixing further with sugar to be used in pastry dough. This amazing tasting pastry is rich in layers of what is called filo(multiple layers of sheets pastry). The sheets are simply held and stuck together by honey. Sometimes chopped nuts are added. It originated during the Ottoman and Byzantine Empire. The name itself of baklava, was first recorded in history back in 1650 where it was known in many different languages of that time. There are some controversies, such as the name was actually originated from Mongolia and used as a loan word in Turkic. This amazing tasty cake is a traditional Spanish treat. What is great about this cake is that it is considered gluten-free. It does not use any flower and its main ingredient is simply almonds. Other ingredients include orange zest, sugar, eggs, powdered sugar and lemon. When we were kids cotton candy is one of the most popular fair foods. Did you know China has her own version of cotton candy? It is in call cotton candy but has the awesome name of Dragon beard candy. You can pretty much find it all over the world in your local Chinatown now because of its global popularity. Like cotton candy, it has a sweet taste and a threaded texture feel. It is very high in sugar at 20% and has 2% fat. If you do happen to come upon Dragon beard, make sure to eat all of it at that moment because it does have a very short life span.